Hi all, my name's Tara, from over at Aquamarine and also Boutiko (which is my day job!). 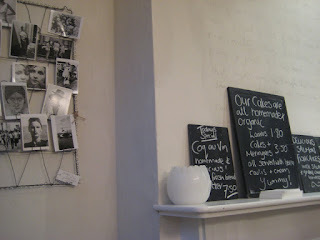 Lynne noticed that I also have a thing about tea and cake, and has very kindly asked me to guest blog. As it's always a good time to discuss all things tea-related I'm very happy to oblige! 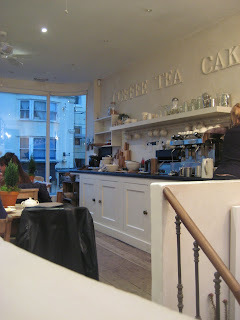 I live in Brighton, and having only moved here recently, am still discovering all the lovely places to have a cream tea. My favourite so far is definitely i gigi, a concept which combines all the best things in life - clothes, interiors and of course, tea (and cake). 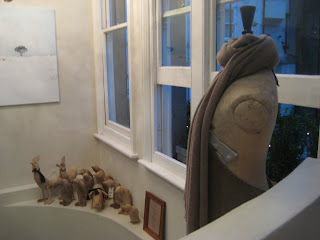 The cafe is just along the road from the clothes shop, upstairs from the beautiful interiors section, which is filled with gorgeous products sourced from around the world in natural and tactile materials like bleached wood, stone, linen and lovely creamy ceramics. Every time I walk in there I secretly pretend it's my house. So anyway, I went for tea there the other day with a friend of mine, after a bit of art gallerying, with a proper craving for a cream tea. It was not to be; they'd run out of scones. 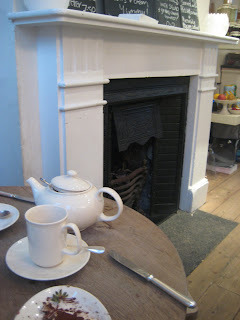 Never mind; we ordered frangipan (for Emily) and chocolate and beetroot cake for me, and a big pot of Earl Grey. 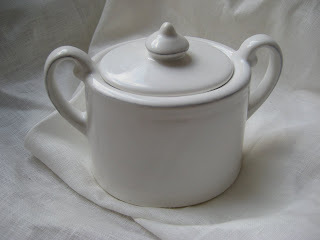 You can buy all the crockery and cutlery, a cunning sales ploy which worked a treat on me when I caved and bought the most sumptuous cream ceramic sugar bowl with handles and a lid that looks like something Marie Antoinette might have used. The best thing about our visit was that we'll have to go back for the scones. ohhh....I love Brighton- I miss going there!! beautiful post. Wow, thank you very much Amy! Twas my first guest blog!